Be the first to share your favorite memory, photo or story of Eleanor . This memorial page is dedicated for family, friends and future generations to celebrate the life of their loved one. 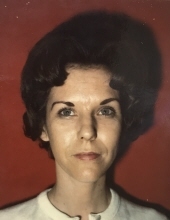 Eleanor “Nell” Land, 83, of Bascom, died Tuesday, February 5, 2019 at Jackson Hospital. Mrs. Land was born in Bascom, FL, December 9, 1935 to Winson and Malv Ditty. She was a homemaker and retired from Sunland Center as a Cottage Parent. She was preceded in death by her parents, and granddaughter, Magon Grimsley. She is survived by her husband of 63 years, Mervin Land; two daughters, Teresa Grimsley of Greenwood and Talana Vogel of Memphis, TN; four grandchildren, Joe Grimsley, Michael Grimsley, Hunter Vogel, and Alana Vogel; two great grandchildren, Levi Grimsley, and Aiden Morse and one brother, Brantley Ditty. Funeral services will be 1:30 p.m. Thursday, February 7, 2019 at James & Sikes Funeral Home Maddox Chapel with Reverend Ken Beard Officiating. Interment will follow at Pinecrest Memorial Gardens with James & Sikes Funeral Home Maddox Chapel directing. The family will receive friends one hour prior to services at James & Sikes Funeral Home Maddox Chapel. To plant a tree in memory of Eleanor "Nell" Land, please visit our Tribute Store. "Email Address" would like to share the life celebration of Eleanor "Nell" Land. Click on the "link" to go to share a favorite memory or leave a condolence message for the family.